YouTube, the popular video-sharing website also has a dark theme. While the company has not made it official, you can still enable it to use. The dark theme will be available on YouTube only if you sign in on YouTube and turn it on. The dark theme is also not available to all. So, you need to check if it is available for your profile. To check, click on your profile icon at top right corner of the page and look for dark mode option. If you cannot see the dark mode option, you need to use a simple browser trick to enable dark mode option. In this article, I will show you steps to enable the dark mode even if it is not available for your profile. Visit the YouTube and sign in. Now, open the browser console. To open browser console, right click on the YouTube page and select ‘Inspect’ (in Chrome), or ‘Inspect Element’, (in Firefox). In browser Console, you will see multiple tabs. Here, select the Console. Now copy the script given below and paste in console followed by the enter. If browser shows you the warning saying you should be careful when pasting content. In this case, type ‘allow pasting’ in the bar and then paste the above code. If it generates the error, paste the code again and press enter. After this, refresh the page and you will see a slightly different UI. Now, click on your user profile icon at the top right and select and see if you get the dark Mode. If you see the Dark Mode option, select this to turn it on. The dark theme of YouTube looks good and it offers a better experience in the night. This only works if you are signed into YouTube. If you sign out, it will be back to the normal theme. It is because it works on cookies. The code you pasted sets the cookie for one year. This only works if you are signed into YouTube. If you sign out, it will be back to the normal theme. It is because it works on cookies. The code you pasted sets the cookie for one year. 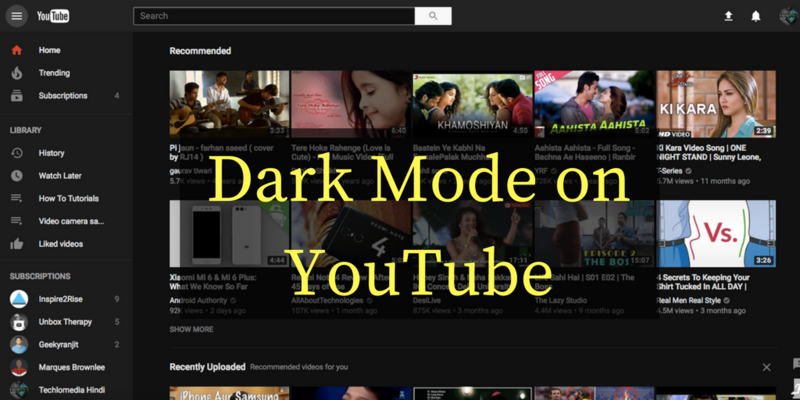 Try the given steps to enable the dark mode on YouTube and enjoy a different YouTube experience.